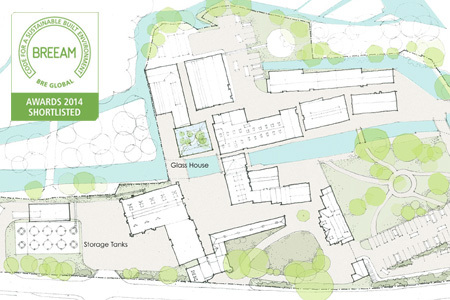 BRE have announced that our Bombay Sapphire Distillery Process buildings have been shortlisted for a BREEAM 2014 Award. BREEAM Awards recognise the most sustainable schemes built across the UK each year and GWP Architecture have been previously recognised as BREEAM Award winners in 2008, 2010 and 2012, our nomination in 2014 reinforces our position as industry leaders in the design of sustainable, affordable buildings. The appearance on the shortlist follows Laverstoke Mill in Hampshire becoming both the first distillery and first refurbishment project to achieve an ‘Outstanding’ design-stage BREEAM accreditation for its distillery process buildings last year. The process buildings incorporate an exceptional level of low carbon and environmentally considerate design features, including a Biomass boiler fuelled by botanicals used in the distillation process, a hydro-electric turbine, the recycling and re-use of building materials from derelict buildings and significant enhancement of ecology across the site. Shortlists of five will be debated by a panel of eminent industry judges who will decide the winner by taking into account several factors including, BREEAM score, particular site constraints and value to the occupiers and users. The prestigious awards ceremony will take place at Ecobuild on Tuesday 4th March in the ExCel, London. Ecobuild is the world’s biggest event for sustainable design, construction and the built environment, while also being the UK’s largest construction event of any kind.